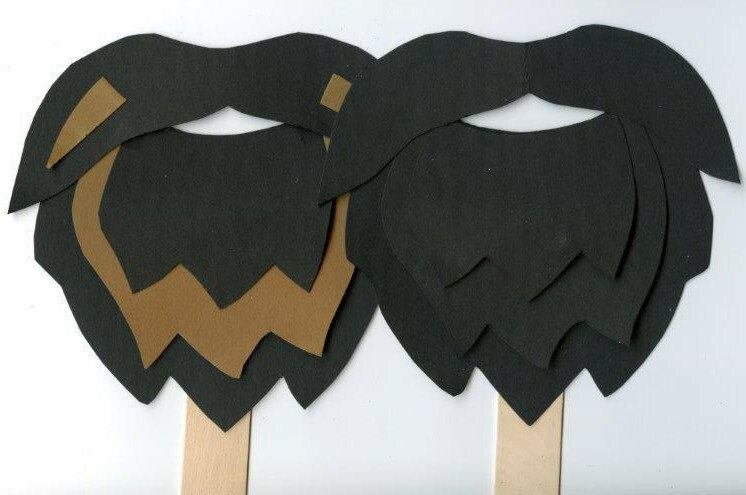 Beards are curiously fashionable at the moment, and now you can make your very own! 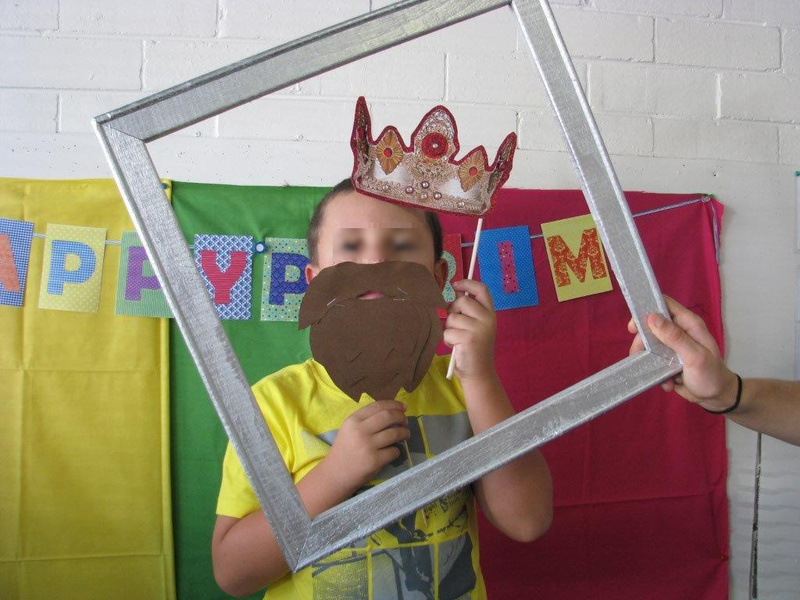 When looking for Purim photo booth props, I found a quite reasonable beard outline. However it was adult-sized and entirely flat. So I adapted it to make it a little smaller, and then added some layers. I cut the beard out of lightweight card and attached it to a large popstick. Unfortunately, black layers on a black background did not provide a great deal of contrast, so I experimented using layers of different colours. I decided that it wasn’t so much the colours that mattered as the depth of the layers. I had joined the three beard layers together using double sided tape near the top of the beard. This left plenty of room to insert a piece of craft foam between the layers so that the lower part protruded outwards, making a much more visually interesting (I can hardly say realistic!) beard. The picture above shows the beards with the foam between layers, but you might just have to take my word for it. The moustache overlaps the beard leaving a small mouth space. The overall impression is possibly less biblical hero and more Lorax, but it’s the thought that counts, right? After I’d made my beard props, I thought it would be a fun activity for the kids too. Here is my beard template with all four pieces on one page. 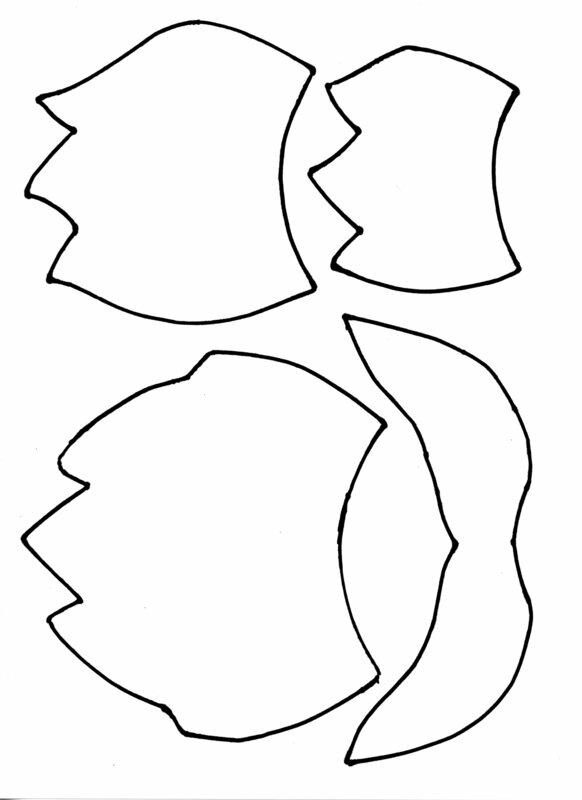 If you pre-cut the four shapes in cardboard, kids can just trace around them. I found it helps for them to see how to lay out the page so as to fit all four pieces and not waste card. The kids were happy to staple their beard pieces together in the absence of double sided tape at the activity day. Enjoy finding new characters to portray with your new beard! 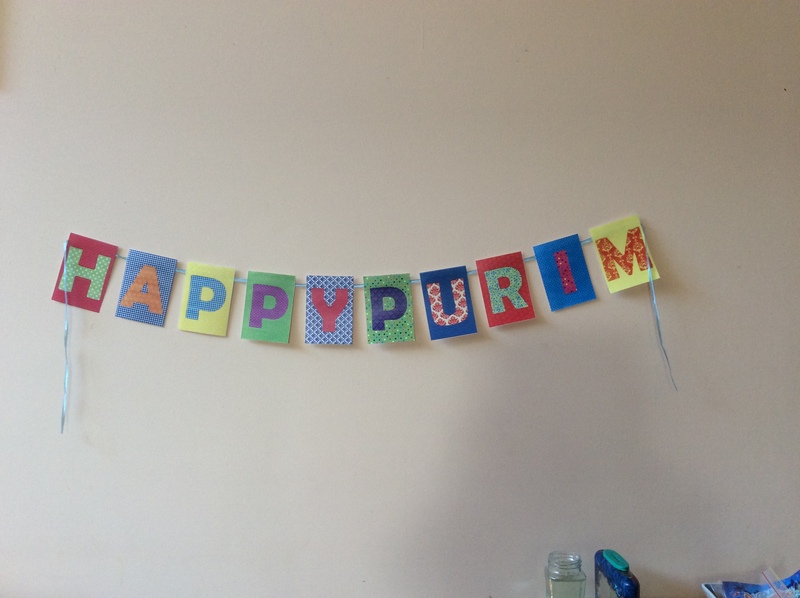 After I constructed my paper Purim banner, I scanned the letters so I could print them out again without having to worry about any cutting and sticking. You can find the individual letters saved as .jpg files on the original post. 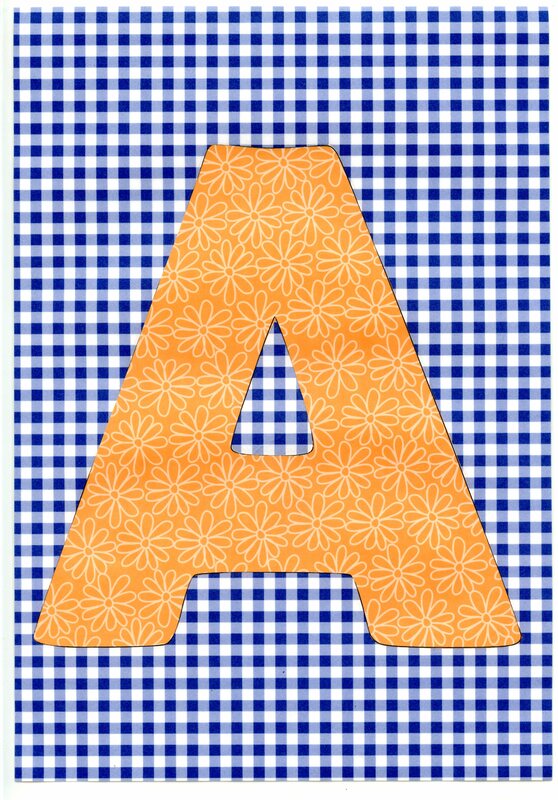 I saved all the letters at their original size into a PDF file – but the file was huge! I compressed the file, but this reduced the print quality. It is probably OK if you want something large (to be seen across the room) but are not too worried about how it looks up close. 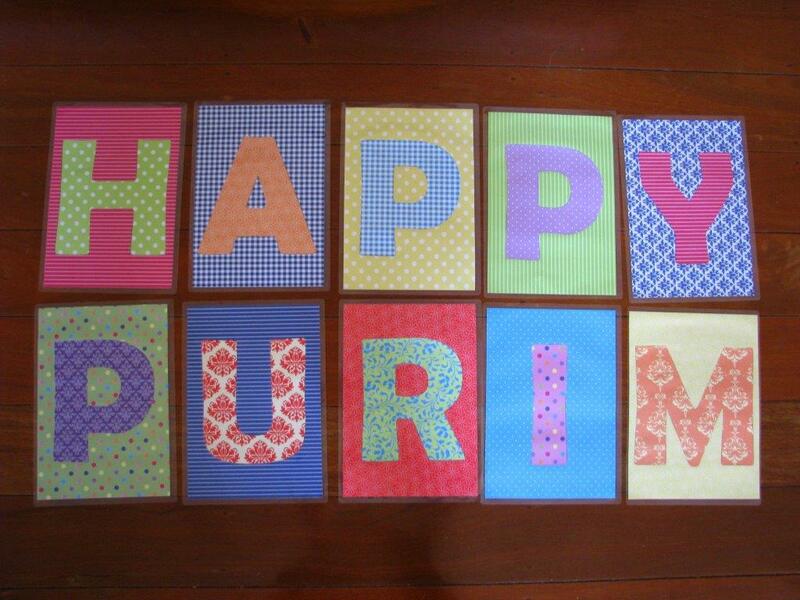 Purim banner – A4 size.compressed. 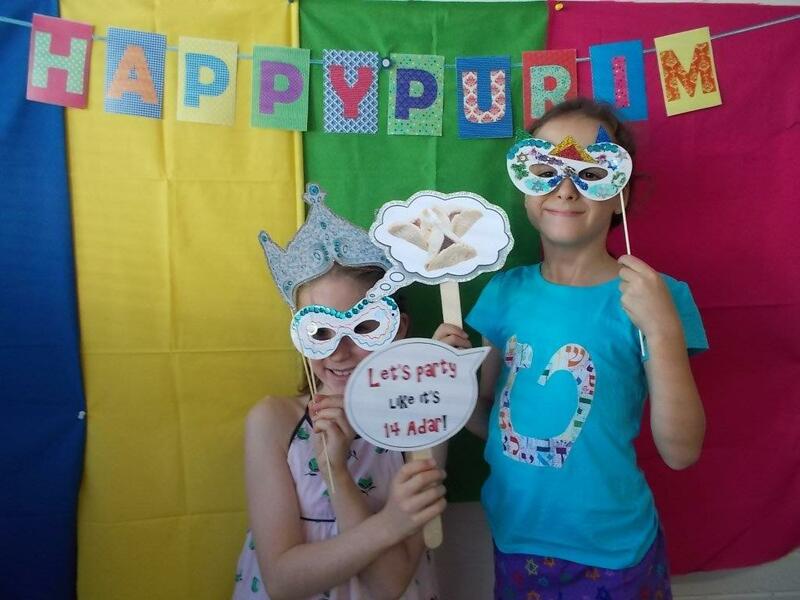 Next I saved them into a PDF file with each letter half as big: Purim banner – A5 size This file has a better resolution and should print fine. 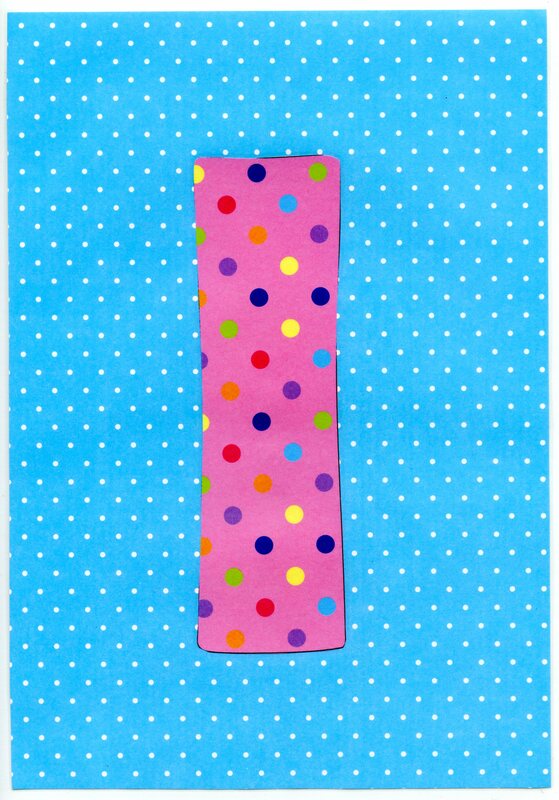 Print, cut out the rectangles, and sticky tape a piece of ribbon across the back. Try and leave slightly more space between the words than I managed on my first effort! 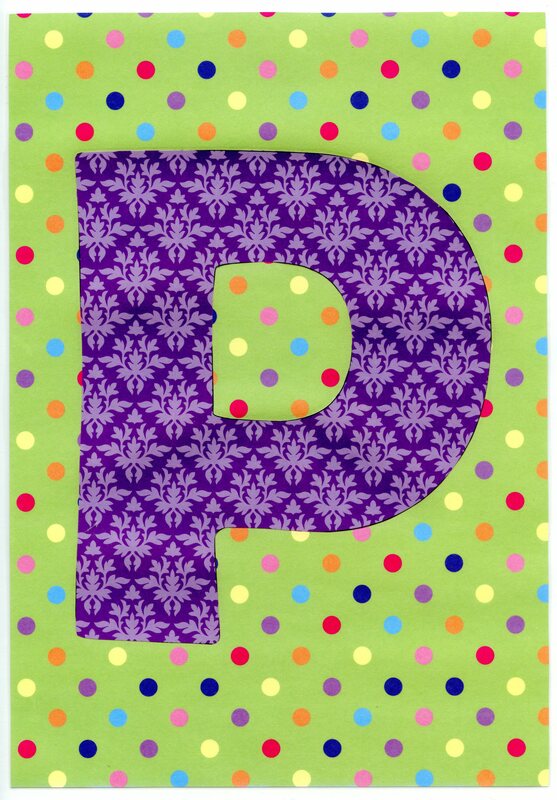 Of course these letters needed to convey the joyful, party mood of Purim, so I decided to make them out of scrapbooking paper in a variety of colours and patterns. These are simple to make if you have access to a printer. Make a template for the letters in Publisher or Word (or other text based software) by inserting a text box onto a blank page so that it fills almost the entire page. (It’s easier in Publisher, but if using Word, you will probably need to specify narrow margins in the Page Layout tab). 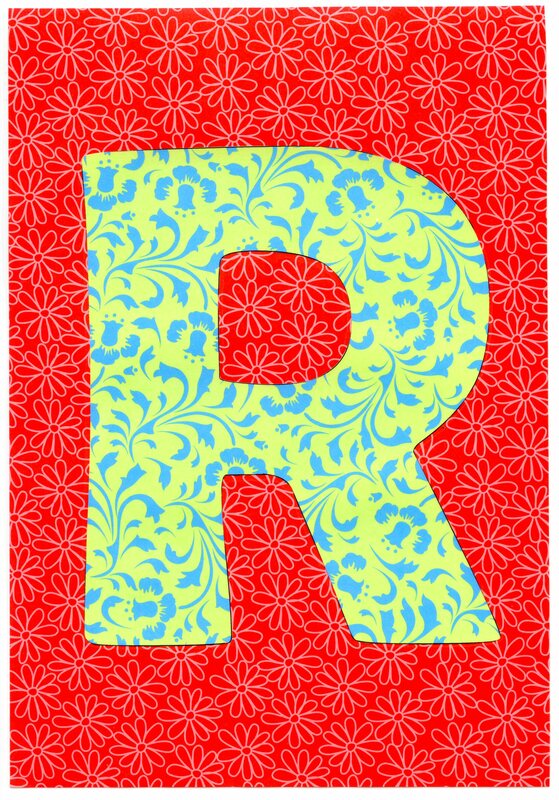 Set the font to something which is going to be easy enough to cut out when very large. I used a font called Berlin Sans FB Demi, size 750pt. Into this box, type one letter. Use the formatting tools to set Font fill to “no fill” but keep Font outline as black (or any other colour). 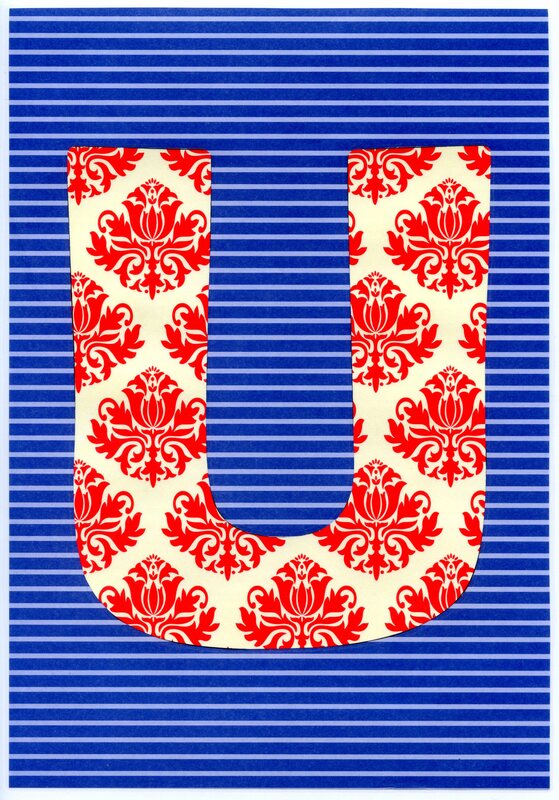 Now you can print out this letter onto coloured paper. I like to buy packs of fancy scrapbooking paper when they are on special. 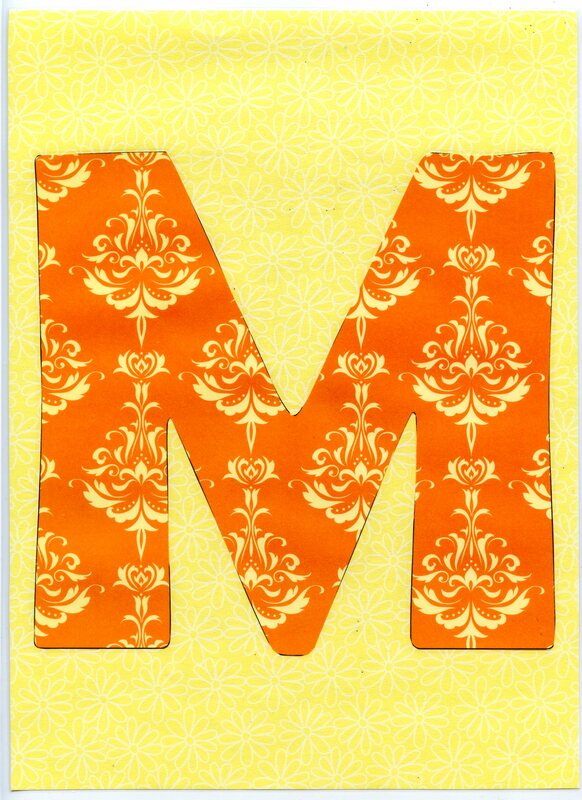 I don’t actually scrapbook, I use the paper for papercuts, card making etc. The paper tends to be square (unlike your printer), but it’s not difficult to fold each piece and cut it to fit your printer tray, or trace around a piece of cardboard the size you need (A4 in my case). It doesn’t matter if the edges of these pieces are not perfect, because you will be cutting out the printed letter in the centre of the page. 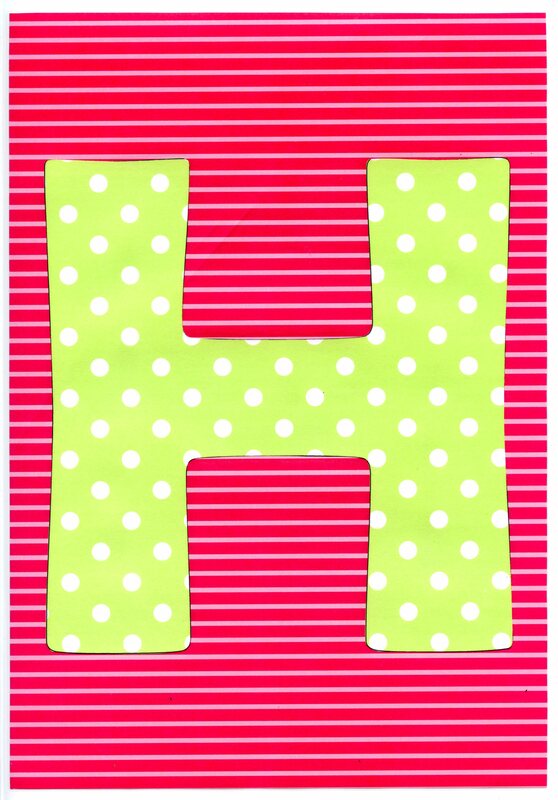 Once you have the letters you need, attach each of them to a contrasting backing sheet. 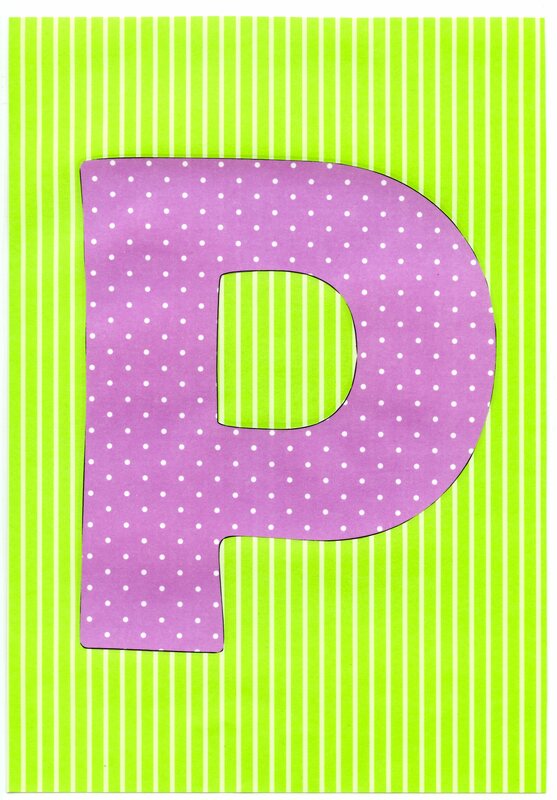 The letters I made would have looked fantastic on 12 inch square backing sheets, but I cut mine down to slightly smaller than A4 because I wanted to laminate them, and I only have A4 laminating pouches. Well that looks great, I hear you say, but I don’t have time to faff around making a template and cutting up bits of coloured paper. No problem! 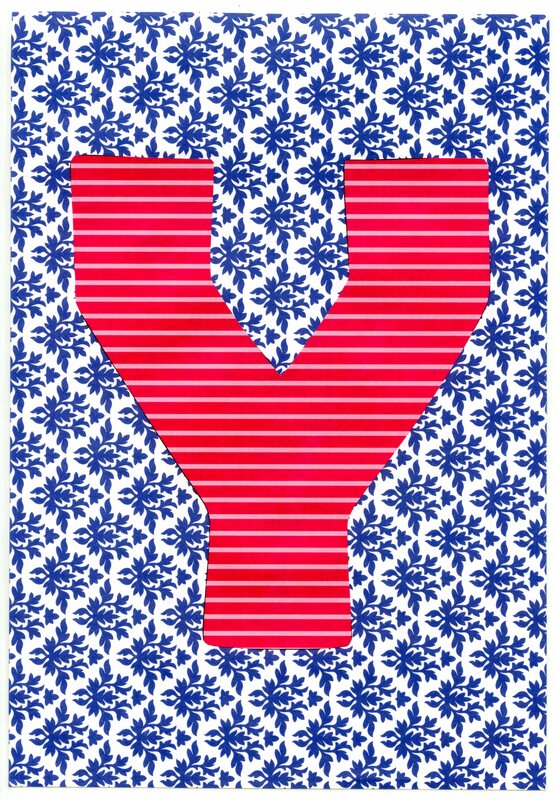 After I made my letters, I scanned them. 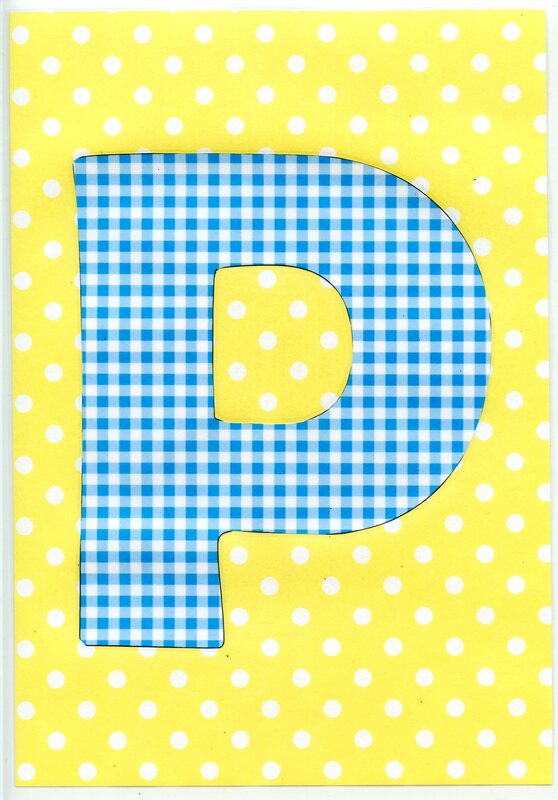 You can download individual letters from this page, or PDF files from here – (almost) no cutting or sticking involved. I was teaching the Hebrew letter kaf (כּ) to some 6-7 year olds, and wanted a quick craft activity to go with it. What starts with kaf? Well all sorts of things actually, but one of them is kippah. 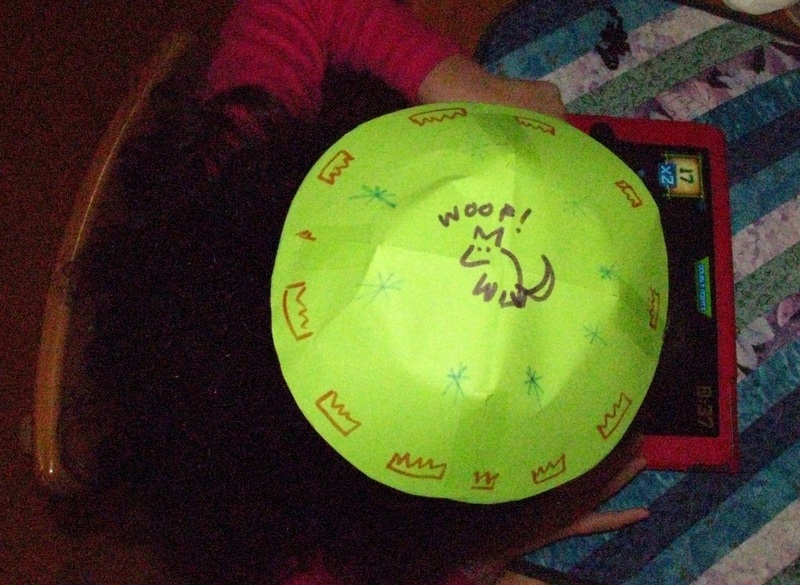 So we made paper kippot. First, draw a circle on a piece of paper. 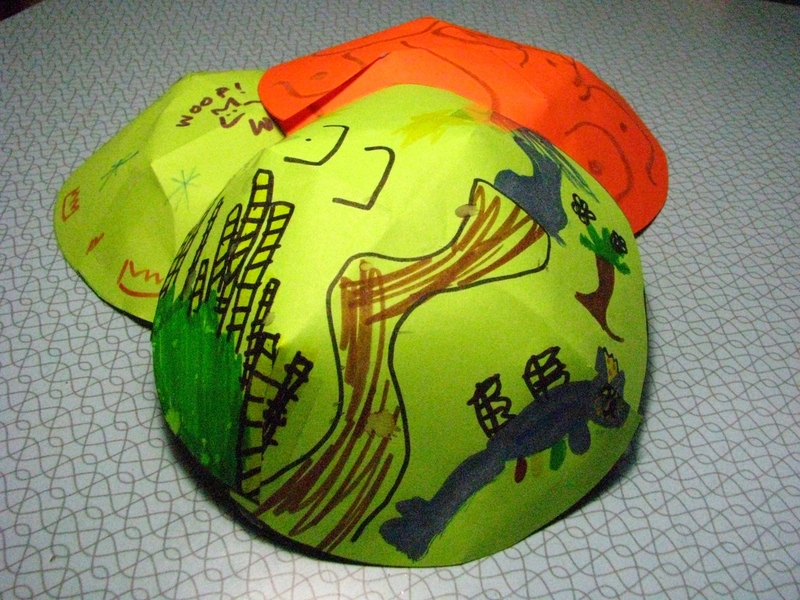 I used an 18cm (7″) paper plate, which makes quite a large kippah. If your child wants to wear the finished product, you might need to make it a little smaller. Next, decorate the inside of your circle. You might like to draw other things which start with kaf, such as keter (crown), kochavim (stars) and kelev (dog) as well as the letter kaf itself. My daughter decided to draw a dragon wearing a keter (crown – starts with letter kaf) while flying over a derech (pathway – ends with letter kaf) through a bamboo forest. Now cut out the circle, and carefully fold it in half, then into quarters. Unfold it again. You will need to cut halfway along each of the four lines you have just made in the paper. 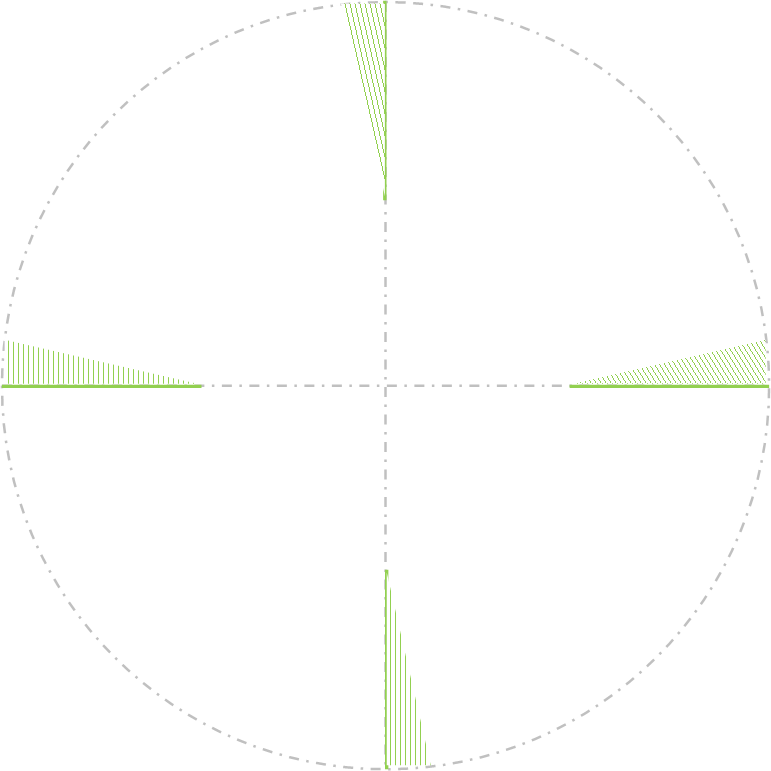 (See where the green lines are on the image below). Once you have made your cuts, gently overlap the two edges of each cut (as per the green shaded area above, adjusting it to the shape you want) and secure it with sticky tape.